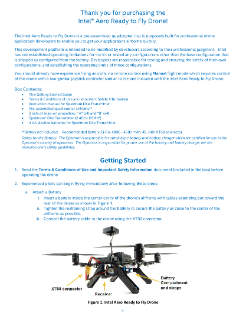 Thank you for purchasing the Intel® Aero Ready to Fly Drone! The Intel® Aero Ready to Fly Drone is a pre-assembled quadcopter that is purposely built for professional drone application developers to enable you to get your applications airborne quickly. This development platform is intended to be modified by developers according to their professional judgment. Intel has not ...established operating limitations for the kit or tested any configurations other than the base configuration that is shipped as configured from the factory. Developers are responsible for testing and ensuring the safety of their own configurations, and establishing the operating limits of those configurations. You should already have experience flying aircrafts via remote control using Manual flight mode which requires control of the drone with a two-gimbal joystick controller similar to the one included with the Intel® Aero Ready to Fly Drone.